Jason Jakubowski - Foodshare | Hunger is Big. Our Community is Bigger. "I believe we have both a moral and societal obligation to solve hunger… and working together, that is exactly what we at Foodshare plan to do." 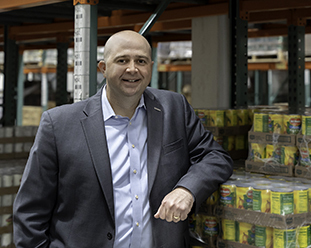 Jason Jakubowski is the President and Chief Executive Officer of Foodshare. He joined Foodshare with over 15 years of experience in public health, public affairs, nonprofit leadership, and community relations. Prior to joining Foodshare, Jason was Vice President of External Relations at Hospital for Special Care and was responsible for all government relations and public/community development at the hospital, its foundation, and all subsidiary programs. Jason previously worked as the Director of Corporate & Community Development at Charter Oak State College. He was elected twice to the New Britain City Council and served two terms as City Treasurer. Since 2006, he has taught Political Science at Central Connecticut State University. Jason currently serves as Chairman of the Board at Leadership Greater Hartford, and he is the Immediate Past Chairman of Community Health Resources in Windsor. He serves on the board of the Middlesex County Chamber of Commerce, and in 2010 he served on the Transition Team for Governor Dannel P. Malloy. In 2008, he was named one of the region’s “40 Under 40” by the Hartford Business Journal, and in 2012, he was one of Connecticut’s seven delegates to the Electoral College for President of the United States. A New Britain native, Jason holds both a Bachelor’s Degree in Political Science and a Master of Public Affairs from the University of Connecticut. He currently lives in West Hartford with his wife and five children and is a longtime coach with the West Hartford Youth Baseball League.